Oak & Dagger Public House and 75+ additional breweries will pour at World Beer Festival Raleigh, held Saturday, April 1 at the North Carolina State Fairgrounds. Click here for tickets. Exhausted after a long drive from Wisconsin, Pete McCabe backed his U-Haul truck into the parking lot of Tyler’s Taproom in Raleigh. It was 2013, and McCabe was joining friends for his first beer in North Carolina. It was meant to be a pit stop on his way to the small town of Farmville. McCabe had accepted a position as a brewer at The Duck-Rabbit Craft Brewery, but his friends—knowing he eventually wanted to open a brewery of his own—couldn’t resist asking how he might transform Tyler’s Taproom into a brewery. McCabe entertained the fantasy, joking with his friends about where he would put the brew house, the tanks, the barrels. Last September, fantasy became reality when McCabe opened Oak and Dagger Public House in that space after Tyler’s Taproom closed. Where once there were two long bars running parallel to each other, now there are fermentation and brite tanks behind glass. An upstairs office was transformed into a mezzanine and fortified with steel beams to accommodate barrels that previously held bourbon, pinot noir, chardonnay and even maple syrup. The 10-barrel brew house itself is just inside the entrance, separated from the dining area by nothing more than a short half-wall. And out back is the Oak and Dagger Research Library, a small bottle shop where he and Tim Clapper, brewery production manager, can get feedback on small-batch beers before scaling them up in the brewpub. Much has changed since Oak and Dagger opened last year, but the space in Raleigh’s Seaboard Station remains a great spot for Raleigh residents to grab food and a beer. 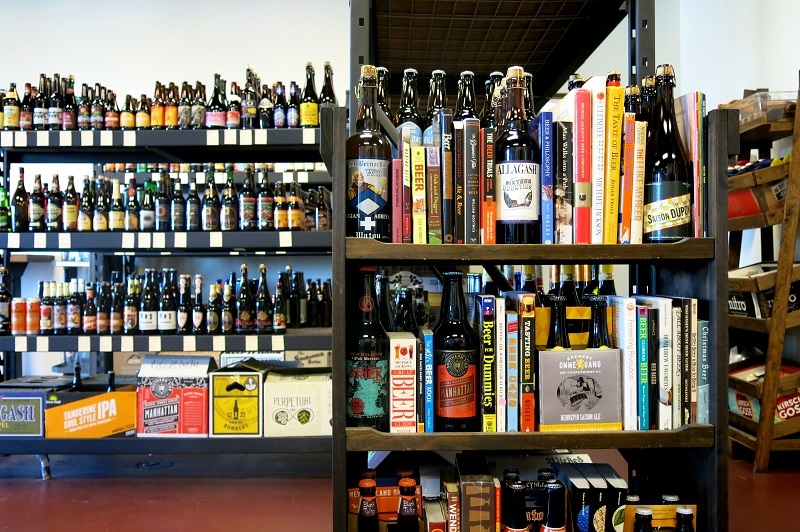 All About Beer: How did you get your start in the brewing industry? 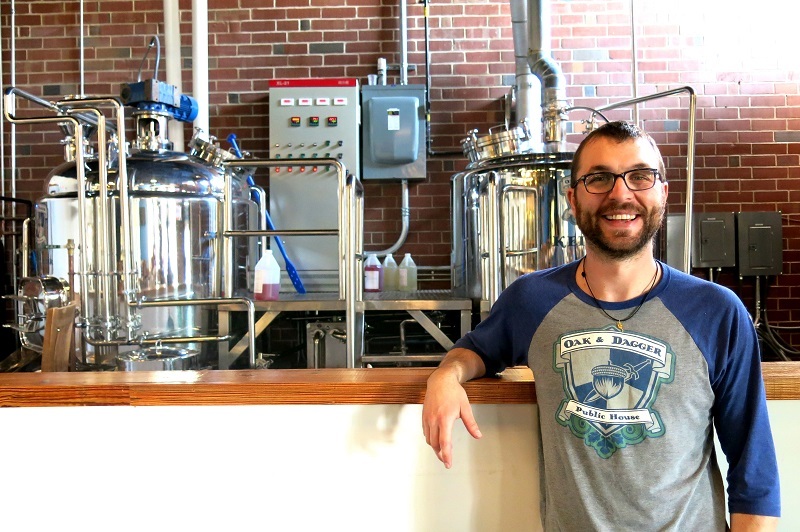 Pete McCabe: I started out as a bouncer at Great Dane Pub & Brewing Co. in Wisconsin, then became an apprentice in their brewery, and then worked my way up to being a head brewer at one of their locations. I worked there for seven years. Why did you choose Raleigh when it came time to strike out on your own? We had something like 140 cities on the list and just kept cutting them down until we got to about five. Then we picked Raleigh. I loved it here. I came to visit for a few weeks and it felt like home almost instantaneously. I got a job at Duck-Rabbit, which is where I met Tim, my brewing partner. I worked there for about a year and a half before I started putting this together, but it’s been around an 11-year process. It was a pretty expansive refit to the inside. One of the reasons we selected this location is that it’s a box. Beyond taking the bar out and moving furniture out, we could build a brewery in spaces around it and keep the brewery open and connected throughout the restaurant. 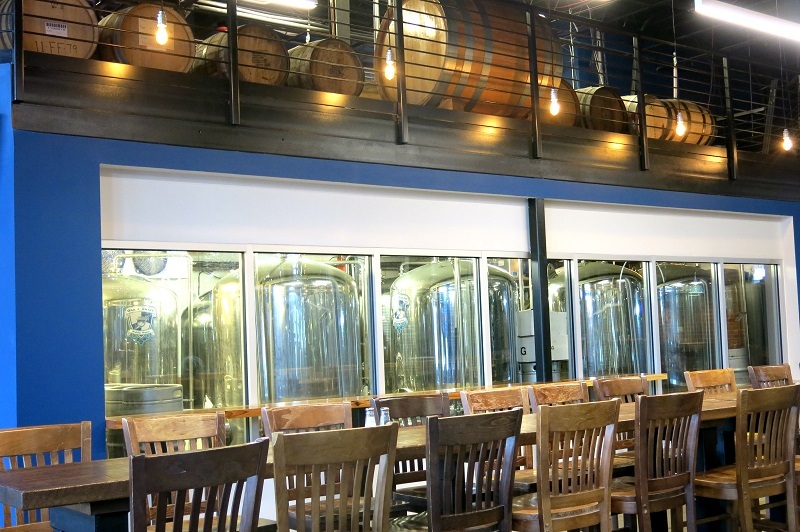 Part of the fun in building this brewpub is, yes, you’re in a restaurant or a, bar but you’re connected with a brewery in some way, shape or form. It always bugs me when you go into a brewery and see the backs of tanks. I feel like people want to see the fun stuff. And you have plenty of barrels up on the mezzanine as well. That was an office. We basically took two-thirds of that and set it aside for barrel storage and aging. We had to get the structure itself reinforced with a little more stainless steel. I could park a couple trucks up there and it’d be fine. That way we can fill a lot of barrels and not have to worry about it. That seems like a pretty ambitious barrel project, to be so young. Part of it is ambitious, but part of it is timing. We have a lot of beers on tap that we think go really well with the aging process, and we wanted to give each of those beers the time in the barrel they need. The foeder, which is up front and center, we filled that with an old ale recipe and we’re leaving it there with Brettanomyces for a year and we’ll break it out for our anniversary. Some of the barrels are aging up there anywhere for a month, to two, to six, to a year or longer. That’s part of the fun of it. We’re not planning on being a barrel program, but it is one of the sandboxes we like to play in. You’ve got to give it the space and size to do it. You have a really diverse lineup of beers. Right now you’ve got American, Belgian, German, even Dutch. Have you found any you would call core beers? Our Coole Beans coffee ale. Tim’s been tinkering with that for eight years. That was just going to go on as a specialty. He did that and named it after his now wife, whose last name was Coole. We were going to put it on just for the wedding, but everyone loved it so now it’s a standard. Our Micro Macro is a standard, the Crystal Dagger is a standard. The Raleigh Pride, which is our ESB. One of my top three beers of all time is Fuller’s London Pride. We’ve got those standards and we adjust based on the seasons. We do want to keep rotating things through to bring in new people and to keep it interesting for those coming back—and for us as well. How did you guys create your food menu? My experience coming from the brewpub originally as a brewer, I think of everything in the context of a meal. I bring beers home based on what I’m eating that night. There’s a lot of discussion about what we can use beer as an ingredient in, what pairs well with what we have going on out here, how do we provide a whole meal to someone. In the end, we put it together in the sense of, ‘What makes a good meal that keeps people coming back?’” We do special beer dinners once a month or every other month. For those, our chef gets to play. It’s five dishes, here’s the theme, these are the beers we think they should go with. We set up at the community table with a bunch of people and just spend two hours just talking and eating. Talking about how beer pairs with the food. It makes it fun. It’s about getting together and having a beer. That’s why we called it a public house instead of a brewery. Beer for us is much more of the social atmosphere—having fun with it, talking about it, having a meal, hanging out. That’s why it’s a public house. And the best Right Field Heckler ever! “Shiner Bock, just a consistently good bock beer”…really?